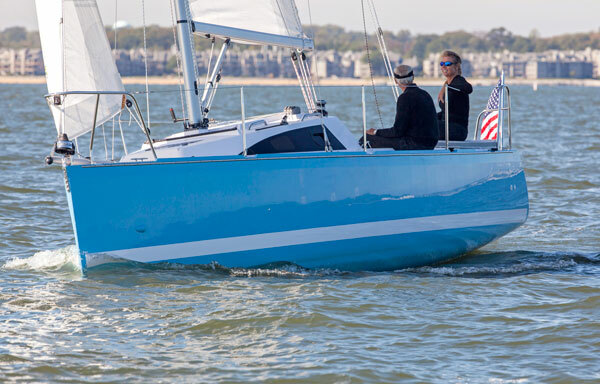 The Catalina 310 packs the amenities of a 40-footer into a 31' hull. It doesn't seem so long ago that a 30-foot sailboat made for a fairly cramped existence. A couple of settees on each side, an eensy little galley, an enclosed head that made a phone booth seem capacious, plus the ubiquitous and foot-tangling V-berth forward. 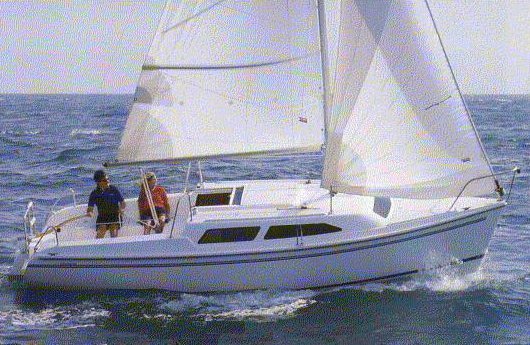 The Catalina 310 makes all that seem far, far away. isn't overly bulky or condo-ish. This is a boat that an owner can point out proudly in an anchorage and say, "That's mine!" "One morning, I was rowing ashore at Catalina Island, and I kept passing all these couples in their 40s and 50s that were alone on their 40-footers," recalls Douglas. "I realized that they bought larger boats than they really needed because they wanted certain features that they couldn't find in smaller boats. They wanted a good-sized owner's berth forward because at this age, we're past climbing over each other to get into bed. They wanted a separate shower and ample water and power to spend time at anchor, and they only needed one comfy cabin plus another for occasional guests or grandkids. That's how the 310 evolved." At 31 feet, the 310 is sandwiched between two existing Catalina yachts: the 30 Mk III, which seems much smaller and the 320, which is designed for families requiring a private aft cabin. "The 310 really is a 'drinks six, eats four and sleeps two' boat," says Douglas. The starting point is a canoe hull that is round right up to the bow knuckle just below the waterline and uses a startling amount of flare in the topsides and a fullness forward to provide space for all the amenities. 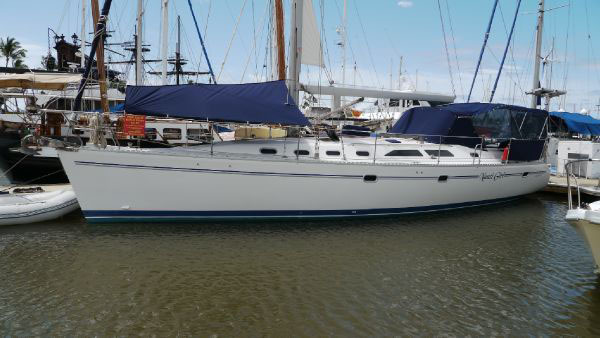 The deckhouse extends well forward of the mast for full headroom in the forward cabin, and Catalina has created a large cockpit because that's where people spend most of their time either under sail or at anchor. Unusual for Catalina, the cockpit has the rounded edges common to Beneteaus or Hunters, and it features a large table as standard equipment. each corner of the stern provide seats as well. Aside from being a pleasantly styled yacht with none of the faddish Euro-styling that will pass from vogue soon, the real beauty of the 310 is revealed when you step through the companionway. Four steps (thoughtfully angled for use while heeled) put you on a teak-and-holly sole amidst an unquestionably yachty interior. 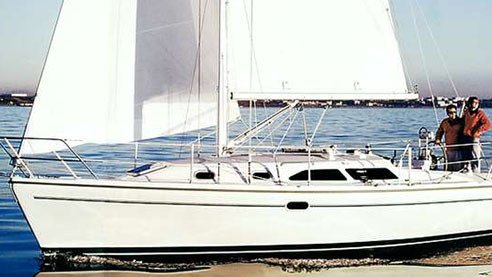 Rather than Catalina's usual ash finish, the 310 has honey-toned teak bulkheads, ceilings and trim. With a complete inner liner than not only provides a glossy white finish but plenty of brightness as well, the 310 is nicely fitted together, with none of the heavy seams of silicone sealant that so many builders use to close awkward gaps. One of the trademarks of Catalina Yachts has always been superlative mold work, both in fit and glossy finish, and this is a fine example of that talent. Immediately to starboard of the steps is the galley in an L-shaped alcove that puts the cook out of the way but convenient to both cockpit and salon. The galley was obviously designed with the concept clearly in mind, since this is the first small Catalina with a standard Adler-Barbour fridge, which has both front and top loading. There's also a gimballed two-burner with oven (LPG Hillerange), and an optional microwave fits neatly into a locker. Something has to give when you tuck a lot of amenities into a small space and, in this case, it's counter space, which is at a premium. To give the cook as much room as possible to lay out sandwiches, Catalina has given up the usual double sink for a deep single, which is a good trade-off in my mind. Another area where you can see that space has been reduced is in the salon, which, instead of the usual long settee on one side, has a loveseat for two. 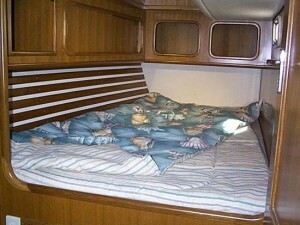 To port is the dining area with a wrap-around settee and a choice of two tables. 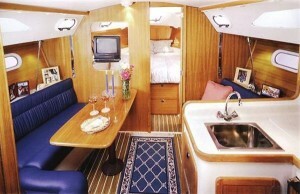 One is a cocktail table for day sailing or entertaining, while the full-sized dining table is neatly stowed in a dedicated rack aft. The owner's cabin is forward, and every inch of space stolen from other areas has been used to make this a truly luxurious stateroom. There is an island double berth with access from both sides and -- get this -- a full innerspring mattress for all the comforts of home. No more skinny vinyl-covered bunk cushions for a 310 owner! be seen from the entire salon through the opening panel. A very slick idea. Aft, the 310 has another double berth tucked under the cockpit, which, with light from ports into the cockpit, is bright and comfy without a trace of claustrophobia. There's a padded backrest and a navigator's table that folds out of the corner by the galley, and this will be comfortable for occasional weekend guests or kids. There's no curtain, but each owner can figure out how to provide privacy. The head is another area where Catalina has spent some of those saved inches, since they've divided it into two sections: aft is the shower compartment with head, and forward is the vanity. It isn't quite like having a stall shower, but it's still a big step above the usual soak-everything-in-sight head/shower combination. Pressure hot and cold water is standard and, since 310 buyers will probably spend more time aboard than just a weekend, there is a 35-gallon water tank plus a 20-gallon hot water heater for ample capacity. healthy and quiet engine pushed the boat close to its hull speed of just under 7 knots. There's nothing particularly sophisticated about the two-spreader, untapered mast and boom that sports double lowers, a solid spring-loaded boom vang and Schaefer roller furling on the headsail. The mast height above the water is 46 feet 9 inches, and carries a total of 494 square feet (100-percent foretriangle) and a 243 square-foot main. 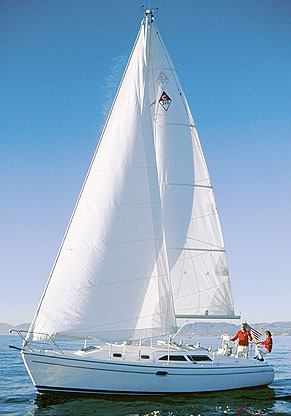 Two keels are available: a 5-foot-9-inch 4,000-pound fin keel or a 4,400-pound wing keel with 4-foot draft for skinny water sailing. Either way, this is a surprisingly stiff boat. Part of that is due to the all-up weight of 10,300 or 10,700 pounds (depending on the keel), which is a ton or so more than her competitors. 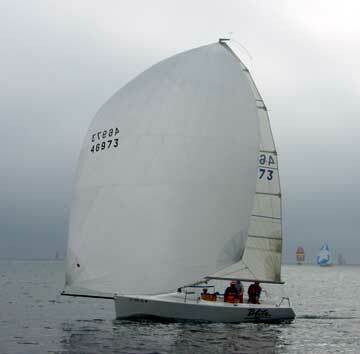 The flared topsides allow the boat some initial heel, and then she stiffens up and is a real pleasure to sail. 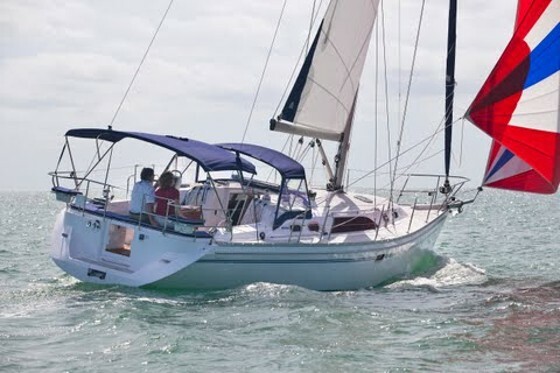 The standard 310 is well outfitted, too, with such niceties as a Maxwell anchor windlass hidden in the deep anchor locker forward, electric fridge, roller furling, diesel power, pressure hot water, shore power, and both full-battened main (with Dutchman furling) and 135-percent genoa included. You'll have to see your dealer to figure out what a 310 is going to cost you (include freight from the Florida plant), but I can tell you that it's one heck of a nice boat. There are going to be a lot of larger boats up for sale when owners realize that they can get all the features they want in a boat that they can sail by themselves. 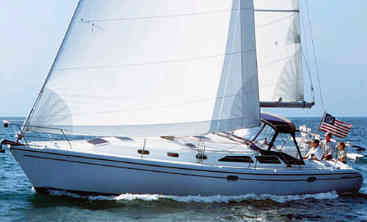 Sail Area 494 sq. ft.